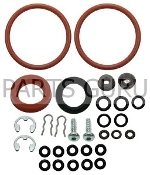 (1) Water Tank O-Ring (0010716); (1) Food Grade Lubricant. If you are skilled & like to refurbish brew group, we recommend you order the Illustrated refurbishing guide (Part # 0010764). It is a very helpful tool to disassemble & re-assemble brew group.